As sweet as slumber can be, we have eight tasty reasons why turning off that snooze button will be oh, so worth it. We’ve rounded up the best breakfast restaurants around the world for when you wake up feeling ravenous, so you can pick the best of the brunch, whether it's elegant egg dishes, superbly stacked pancakes or hearty Full English’s you fancy. Start the day as you mean to go on and tuck into one of these brilliant breakfasts on your city breaks and summer holidays - wherever your travels take you, we can guarantee your taste buds will be tingling! 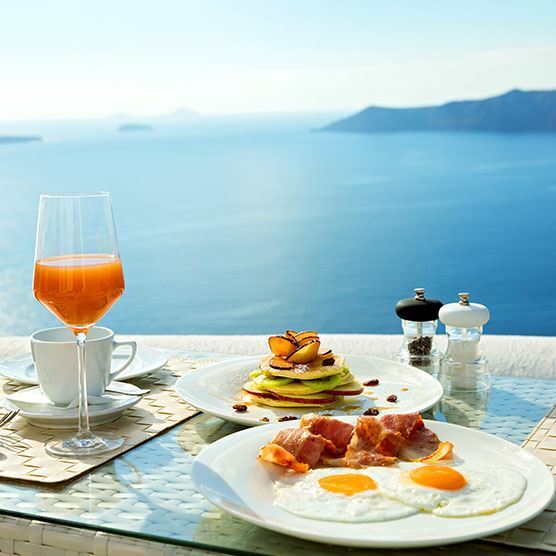 If you fancy breakfast with a view, look out for this luxury lounge bar perched above the famous Santorini caldera. Ask to be seated on the terrace and you’ll be met by panoramic vistas of deep blue sea and volcanic islets, as you tuck into tasty Mediterranean cuisine including exotic fruits and traditional Spanish omelettes - starting your morning at Character will be the icing on the cake during your gorgeous Greece holidays. Take a look at our pocket guide to Greece for exciting things to see and do around this idyllic island. Fancy enjoying your brunch by a pool with gorgeous sea views? Marbella Club is the perfect place to see and be seen while you enjoy a Sunday brunch buffet that stretches late into the afternoon. It’s one time when carbs and Marbs can be best holiday buddies, especially if you’re nursing a hangover from time spent in the bars and clubs of the ‘Golden Mile’ the night before. Marbella holidays are perfect for summer sunshine breaks or luxury last-minute getaways, and this top beach club is a must while you're here. Don't forget your camera for those all important living-the-high-life snaps in the Spanish sun! What's more romantic than a trip to Italy. Jazz your breakfast in Venice at Al Parlamento’s excellent eatery, located in the Tre Archi area of Venice. This rustic bar overlooks the canal and is the perfect place to stop for a bite to eat before the hustle and bustle kicks in. The Sunday brunch here is accompanied by live music concerts often inspired by jazz, blues and rock classics – so if you’re looking for sights, sounds and snacks, it’s got them all covered! Whisk your loved one away on an idyllic Italian escape or why not take a look at our top 10 romantic getaways in Europe? When hunger strikes, Holybelly is on hand with hearty portions of eggs, delicious pancakes and freshly baked artisan bread to reduce those mid-morning rumbles! This Melbourne-style café serves breakfast from 9am-12pm, which means you’ll have plenty of time to sample the popular porridge with coconut milk and seasonal fruit; sweet and savoury pancakes drizzled with Bourbon butter and maple syrup; and a selection of cooked goods served with sourdough toast! Get in quick, as this popular breakfast bar in Paris doesn’t take reservations. Breathtaking views are also on the menu at this signature restaurant, located on the 122nd floor of the cloud-scraping Burj Khalifa. Your belly won't be rumbling for long as you sit down to what can only be described as a Royal Banquet, with culinary delights including everything from Alaskan King crab to slow-roasted Wagyu beef leg. Choose from one of the popular breakfast packages at Atmosphere for your continental, main course and a la carte breakfast options and enjoy a sophisticated start to the day with stunning views - for more top tipcs check out our top 15 things to do in Dubai!. Head to this Lower East Side eatery for scrumptious So-Cal inspired snacks. Pick up one of the pastries for a brilliantly buttery breakfast or grab a garden-variety chai-seed pudding for something a little lighter, before you head out into buzzing New York City. With a mixture of sweet, spicy and sour flavours on the menu you’re sure to find something that satisfies every snacker at El Ray Luncheonette! The refined Cafe Savoy restaurant on the castle side of the river has an elegant exterior complete with flying cherubs, but it’s what’s inside that’s really heavenly. The delicious coffee is famous around the city of Prague – try the Savoy café au lait with chocolate and cinnamon – then you’ve got seemingly endless egg dishes made using eggs from a family farm and served with fresh homemade bread. We also liked the sound of the French toast with fresh fruits and maple syrup and the baked ham brioche bread with Gruyere cheese and poached egg – we’ll take both please! Thankfully, you can feast on french toast a little sooner than you think with our list of favourite European day trip destinations! This terrace restaurant at Ladera resort serves up spectacular views of St Lucia's iconic Pitons - a highlight of any St Lucia holiday. The menu is equally impressive, with delicate dishes including tropical fruit platters, fruity french toast, pumpkin pancakes, traditional meat dishes and more. The restaurant and bar at Dasheene is open from 9am every day, but it's worth returning in the evening for cocktails and live music-shows. If you fancy tucking into a taco while you're getting your fortnightly trim, this barbershop turned brunch hotspot is just the ticket. Cut Throat's tasty menu serves up all of our favourites from fluffy pancakes and delicious egg dishes to juicy burgers and chicken waffles (yep, you heard correctly) - so there's something to satisfy everyone's taste. Brunch is served daily until 4pm, but if you're visiting on a Sunday you'll often find free-flowing Bloody Mary's in store - what better way to round off your Amsterdam holidays?